Elder, or Elderberry (Sambucus), is ashurb-like plants from the family of Adoxaceae. Best known is the black elderberry, which we will refer to in a later article. The white flowers are ideal to make a cordial or syrup which is diluted with alpine mineral water (or other sparkling water) a summer drinking speciality which is typical for the central and northern European areas. Use only proper white elderflowers and collecting sparare the flowers form ost small branches. Take along some clean plastic bags and make sure smaller insects are removed from the blossoms before you go. Be sure to process the elderflowers quickly after collecting. Basically syrup is made of 1 part water and 2 parts sugar. The sugar can also be increased up to 3 parts. Elderflower Cordial can be produced without heating. Unfortunately, due to the formation of various spores in the air it can therefore mould easily. 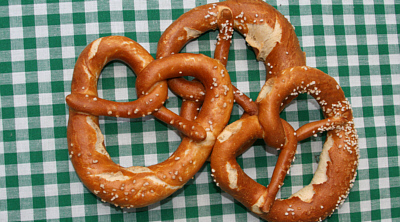 Here follows a recipe which is longer tenable. We take the largest pot for cooking pasta which we can find in our kitchen. The more syrup manufactured at once the more homogeneous the working steps. Dissocle with 10 kilos of granulated sugar with 5 litres of tap water and let boil. But away from the heat and add as many elderflowrs as possible press them down with a wooden spoon and add some more until they no longer into the pot, or that at least all the flowers are covered with water. You should know that in order to taste the best, many flowers are needed. The quantity of flowers may be in a serious recipe obviously not in grams. The more the better. 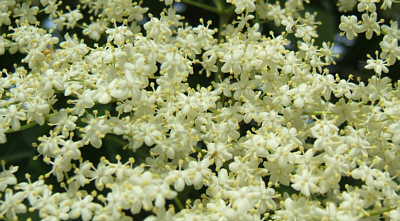 The ballpark figure for an intense taste should be at least 20 elderflower heads per litre, or nine per pint. Let boil up again, and then quickly remove from stove. Cover with a fitting lid, preferably with rubber seal. After a week filter the syrup through a cloth (cooked – you know these nasty spores) - or professional - by a Etamin, based on a screen, or better on a screen is pointed and pour directly into already cleaned bottles. More precisely: pour in pre-cleaned glass or PET bottles (cooked water) with a large funnel and a scoop, don't forget to stir thoroughly before filling. Elder is said to have an anti-inflammatory effect on bronchi and thence to the lungs. If you are not too considerate of the medical implications you can go for a elderflower-sprizz – combining the cordial with some nice cold Sekt, Prosecco or Cava, the perfect Aperitif for a summernight's party! The elderflower cordial is a pefectly fruity syrup to add to desserts, like our yummy elderflower cordial cupcakes. If you are looking for funky and extravagante accessories for your Alpine summernight's party, have a look at the interior section of our online shop. Wonderful porcelain cups, cushion in the form of Edelweiss, candles and funky candleholder.